Let there be light! Consider this one of foremost mantras in the art of good interior design. And while this applies to artificial fixtures and bulbs (as well the right placements around the home) it's arguably even more crucial to apply this sacred mantra to your home's natural light situation too. Nothing against artificial light of course—it's ultra important to strike the right balance when it comes to this ingredient of your home's overall mix of aesthetics and mood, and the way a home embraces and uses its natural light really makes a huge difference to the overall feel and quality of the interior experience. 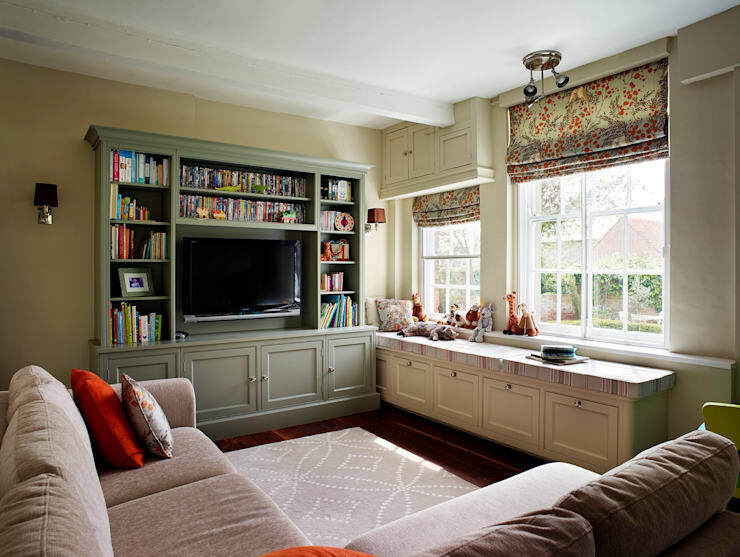 Window placement, and the way we dress and frame our windows from the inside, determines the quality and quantity of the natural light that we let into our domestic spaces, so it's important to get it right. Whether we're talking about the best blinds or curtains to use, the right textures and colours, or indeed the right style of window from a fundamental structural perspective, give the right treatment to your homes windows and you'll be living in true splendour. Today on homify, we're here to shed a little quality light on the art of window perfection: the ins and outs of how to go about making your windows shine with brilliance, and make all the difference on your interior setup. What better way to embrace the glorious light of the daily sun than with full floor to ceiling windows? Every home should enjoy such a lavish burst of natural light, though sometimes—especially in the peak of summer—lots of light can a little too much to bear. No need to remove those panes or set up exterior awnings: simply select a good and proper curtain. 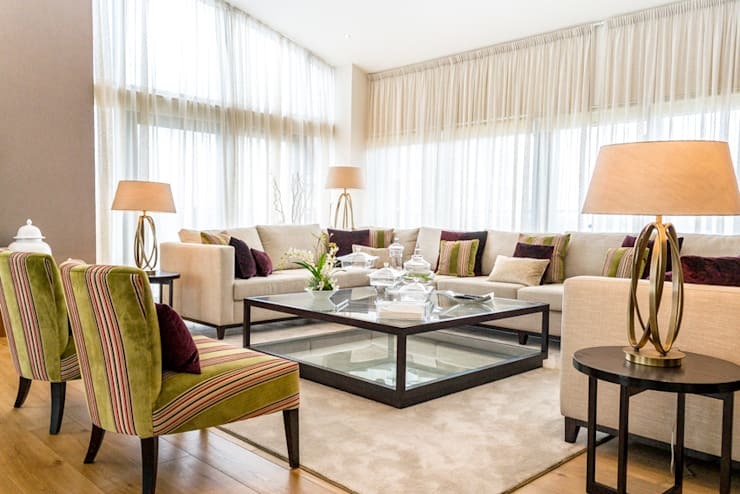 In this fabulous chic living room, light can't help but stream powerfully in. To regulate the flow, the owners here have opted for a sheer, peach toned curtain drape: full length, classy and in perfect harmony with the decor of the room. Sheer and chic: a formidable way to keep excess light at bay, while embracing its goodness through a svelte light scrim. Less is indeed more when it comes to a lot of elements of interior design, but it's not the case in absolutely every scenario. Who says your windows shouldn't enjoy lavish, long drapes to regulate the light coming in? 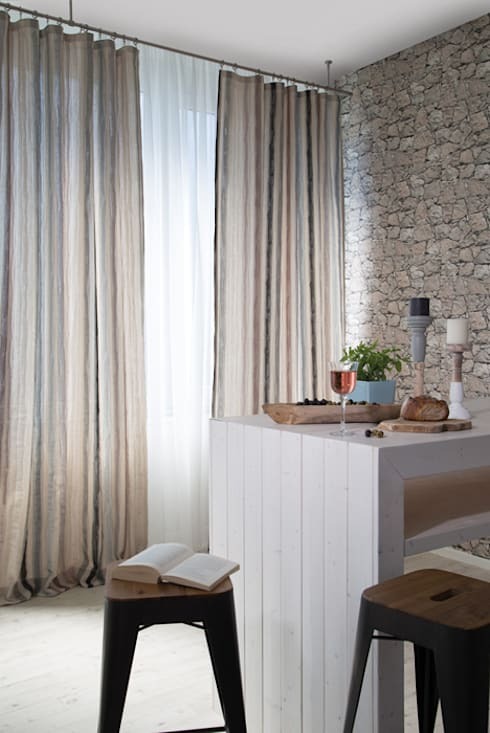 Long, lush curtains, as we see in the fine example, add to a sense of warmth and luxury when matched with the right living, lounge or bedroom setup. By all means, let them touch the floor! There's no rule to say you can't get away with it: it looks great, feels great, and offers a neat balance between natural brilliance and a more cloistered cosiness come the evening. Striking the balance can be a trick art, so you're feeling a little out of your depth, you can always chat with a professional to ensure you get the design and style you desire. Of course, it's not to say that all this window-framing action has to take place inside the home. We also ought to consider what can be done from the exterior. 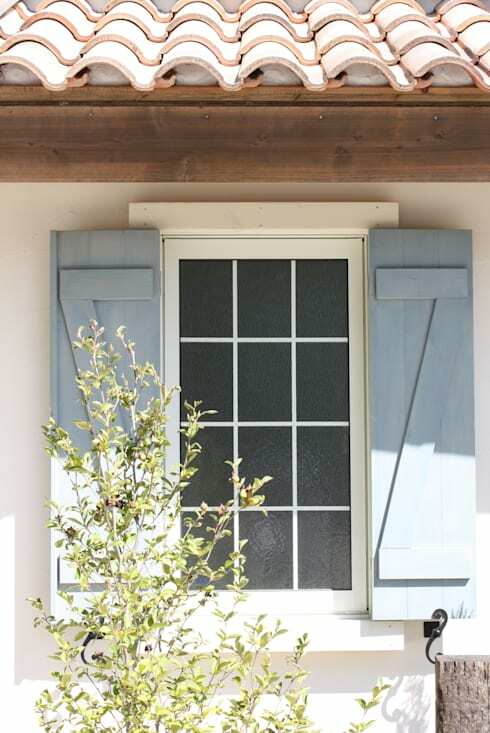 Here in this fine example, soft blue wooden shutters create a delightful aesthetic statement to the home's quaint exterior, while performing the vital task in protecting the interior from full-bore summertime sunlight. Cute and practical, with a fresh hint of charm and character incorporating exterior shutters to your exterior is both practical and easy to do. If adding exterior shutters to your house isn't the most practical or stylish option for you, no problem, simply bring those shutters indoors and work your 'exterior shutter' convention on its head. 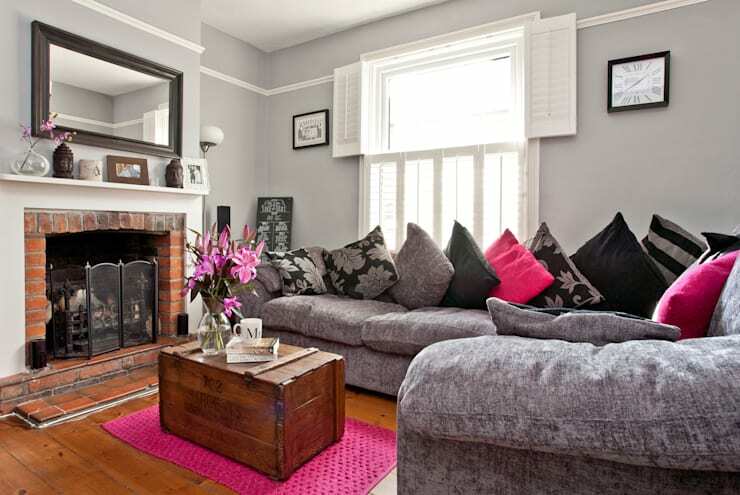 What a gorgeous, and unexpected, addition these white shutters make to this attractive and comfortable lounge room. When the mercury rises, all that's needed is a quick flip of these top rung shutters to minimise the brilliance and keep the home, and its occupants, comfortable and content. Neat and sweet. There really are so many configurations and options to choose from when it comes to framing your home's windows the right way, and both maximising and controlling the natural light that your interior spaces enjoy. Enter from stage right: the wonderful world of blinds! Yes, curtains and drapes have their lacy charm, but blinds offer the occupant another level of protection, robustness and versatility. As exemplified here, we see how blinds can be a real asset to an interior space: this full wall window facing out to a courtyard lets the light in to a maximium effect during the day; come night, horizontal white blinds fold in unison to create privacy and security. Come summer, they remain the perfect combatant to those hot sunny days when the reflections and refractions become a little too much to bear. Okay, now we're starting to get a little fancier. If your interior space craves and demands that extra touch of sophistication and aesthetic brilliance, you might need to up the window ante with a fresh flourish. Here, a well selected valance, or pelmet, can really make a statement. What are these things exactly, you ask? Well, the valance is best known as a form of window treatment that covers the uppermost part of the window, very popular in Victorian era design. The pelmet functions very much like a valence, only with more stiffened fabric, shaped and embellished with decorative edgings like trims, colour bands and tassels. The moss green drapes and pelmet setup in this example perfectly exemplifies what's possible: a gorgeous, Victorian-inspired, charming lounge room setup. What better way to enhance the vibrancy and richness of the natural light outside than with a complementary burst of colour? 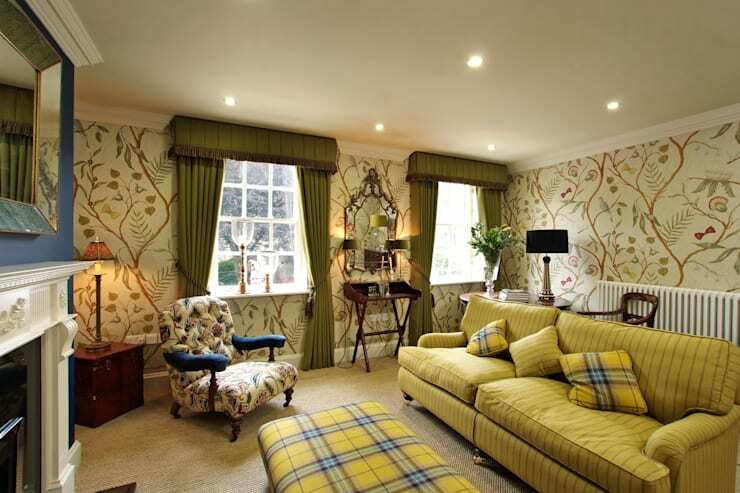 Here, matching gold and teal patterned pull curtains collude with the unique colour burst of the curved lounge and cushions, maximising the effect and feel of the natural light streaming in—a really gorgeous treatment to these fabulous opulent windows. 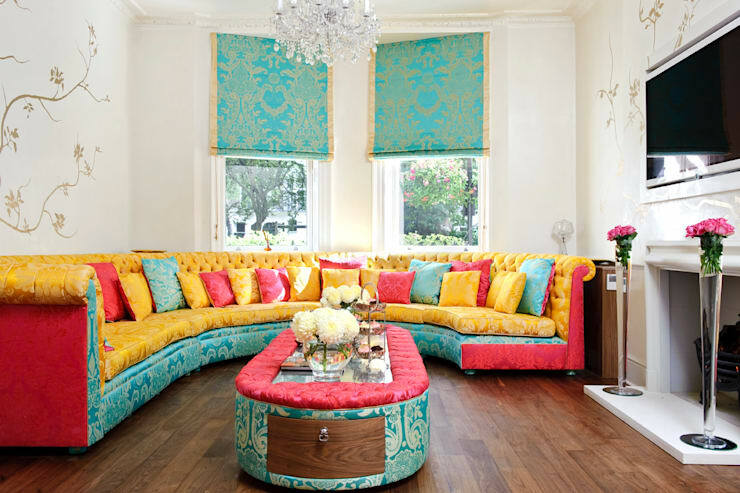 Colour is a window treatment's ally, but so too is textile patterning. Pick the right pattern and frame that window with style and flair. 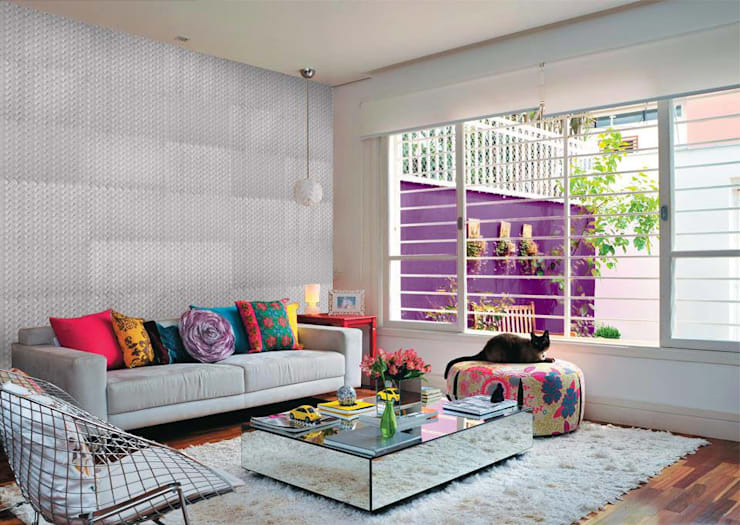 The occupants in this neat example show what can be done with an excellent selection of patterning. Perfect your patterns, and perfect the flow of light, as well as the overarching effect of your feature windows on the dynamic and soul of your home. What is your favourite way to dress a window? We'd love to hear from you in the comments below!